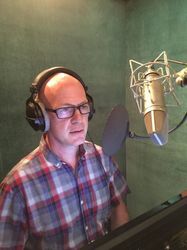 Derek Stephen Prince, aka Steve, has been in the voiceover industry 22 years. His career spans across such shows as Power Rangers Turbo, Power Rangers In Space, Power Rangers Lost Galaxy, Power Rangers Time Force & Power Rangers Wild Force; Digimon: Seasons 1-4 & 6-7 playing such favorites as Digimon Emperor, Veemon, Beelzamon, Impmon, Piedmon and most recently Jeremy, to name a few; Love, Hina where he played Keitaro; Bleach, where he played Uryu Ishida; and Naruto, where he STILL plays Shino Aburame (my God, does this show not end??? ); Guts the pug in Kill La Kill; and Iggy the Boston Terrier in Jojo's Bizarre Adventures-Stardust Crusaders. Video games include the Kingdom Hearts series as Vexen; Odin Sphere as Oswald; Operation Darkness as Adolf Hitler and Jack the Ripper; Fuyuhiko Kuzuryu in Danganrompa V2; and Kokichi Ouma in Danganrompa V3. "Steve" was in the original cartoon series of Lilo & Stich as Loki the shaved ice vendor; Little, Big, Awesome for Amazon; NFL Rush Zone - Guardians Unleashed as Jackson; the film Jungle Shuffle with Rob Schneider and Drake Bell as Louca the toucan; and the film Bling where he played the ring vendor, opposite Taylor Kitsch. Both movies are available through Amazon Prime.